Sometimes on those hot summer days, the last thing you want to do is cook & eat a hot meal. A simple cold salad may be all you need to fill your belly and beat the heat. Around here, we’re big fans of veggie-based dishes that taste great. We dug up this ‘Bulgur Salad with Cucumbers, Red Peppers, Chick Peas, Lemon and Dill’ from Once Upon A Chef and it has been a summertime favorite for a few years now. One of the main reasons we love a good veggie dish is that they can help to reduce general inflammation, aid recovery, and promote a nutritional balance within the body. When you pair a healthy diet with consistent massages such as Thai or Relaxation, you help set your body up for success. Bring a kettle of water to a boil. Place the bulgur in a large bowl with 1/2 teaspoon salt and 1-1/4 cups boiling water. Cover the bowl tightly with saran wrap and let sit for 25-30 minutes, or until all of the water is absorbed. Meanwhile, to soften the bite of the raw onions, place them in a small bowl and cover with cold water. 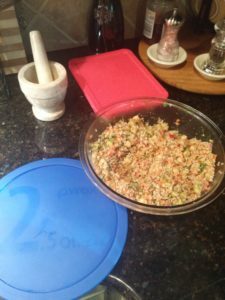 Combine the cooked bulgur with the red onions, remaining teaspoon of salt (I know it seems like a lot but the salad is bland without it) and all of the other ingredients. Season to taste with more salt, pepper, sugar or lemon if desired. Serve cold. In the end, you should end up with about 2 quarts worth. It makes a super easy packable lunch or a quick dinner you can enjoy for a few days.